This extract is taken from a record kept by the vicar of All Saints Church in Dorchester Dorset, written on September 11, 1907. I got to the riverside just below our town of Dorchester at about 6 p.m., and began to fish where the two principal streams of the Frome unite. There were several fish rising, and taking chiefly minute insects of some kind. After trying many flies, and only getting one touch, besides bagging one small trout under a pound in weight, I left them in despair, really believing that the rising fish were dace, and not trout. In about half an hour I passed the place again on my way home, and noticed that two or three were still occasionally rising. This was just after 7 o’clock. It was getting dusk but being a light evening and the water quite open I could see to cast fairly well. My fly was taken quietly after a cast or two, and I struck gently. The response was terrific splashing and boiling on the surface of the water, like the action of a fish that is very lightly hooked. For a moment I though that I must have accidentally hooked an otter, or that an otter had seized my fish. However the commotion ceased and the fish came down towards me into the deep water by my side. This was a large hole eight to ten feet deep. For about a quarter of an hour the fish remained at the bottom, cruising round and round, then slowly worked downstream about 50 yards, whilst I kept as firm a pull on him as I dared. Then, fortunately, he turned, and another quarter of an hour of up and down work followed. Once or twice he rose to the surface, and lashed the water with his tail. Once he sprang up clear above the water and then for the first time I realised what a monster I was into. After about another quarter of an hour he began to yield and was more often on the surface than below, and I could venture to pull him about a little. Seeing how hopeless it was to land him myself, I looked about for help. No one was in sight except two women ironing by lamplight at the open window of a cottage two hundred yards away. I shouted and whistled to try and attract their attention, but all in vain. I felt that I could never land the fish alone, and must risk something unless I was going to stay out all night. So I gave the fish a good hustling, then fixed my rod into the bank overhanging the water, with the line arranged to run freely, hurried across the field to the cottage, and asked the women to try and find a man or boy to come down to me. I ran back again, took up my rod and found the fish still secure. Soon two men came down and we decided that we could not land the fish without a large landing net. We found it impossible, owing to the depth of water, to get at him and lift him out with the hand. So one man went off for the river keeper ( T.Pomeroy ) , whilst the other went home for a lantern, as it was now dark. The keeper was still out, and this led to further delay, whilst all the while I was towing the fish round and keeping him tired. At last the keeper came with a landing net, but this was too small, so we determined to get the loan of a clothes basket from the cottage, and try and lift him out with that . The keeper sank the basket, and held it out at arms length with one leg in the water, while the lantern was arranged to light up the closing scene. 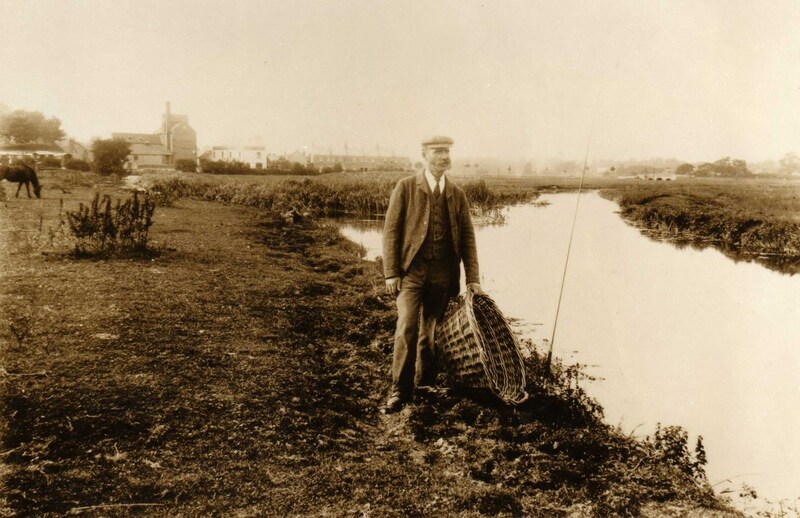 Presently I was able to tow the fish into the prepared trap, and then with a great lift he was swung up in a streaming basketfull of water on to dry land, the keeper between him and the water. It was twenty five minutes past eight then; I had hooked him about an hour and a quarter before. We gathered up all our tackle of different kinds, and marched off home. Here we weighed him on a grocer’s scales, not a spring balance, and found his weight to be exactly 12 3/4 lbs. This was after thoroughly wiping and drying him. It was a male fish, not sewer fed, as our water is now all unpolluted. His length was 29 1/2 inches, and girth 18 3/4 inches. He was in splendid condition, with clean white belly and silvery sides, full and deep. 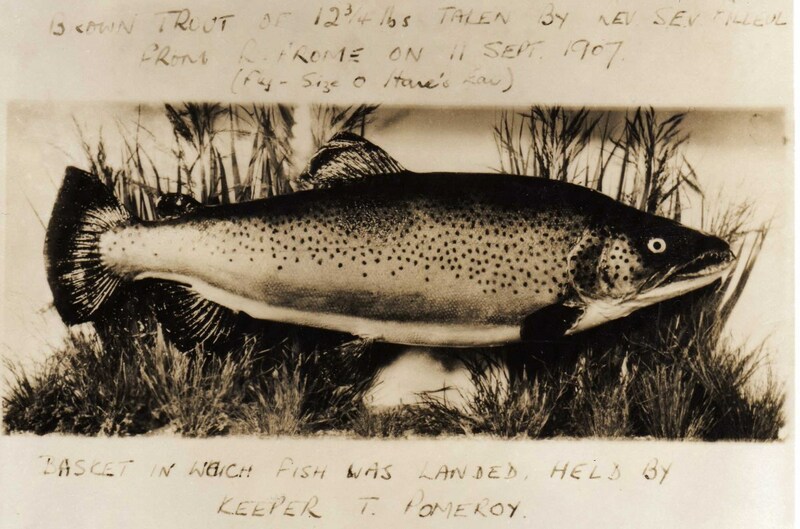 Of course, from first to last, the capture of such a fish on the lightest dry fly tackle was simply owing to a succession of fortunate accidents. My rod was a light 10ft two joint split cane weapon – Hardy’s “Perfection” – the fly a No. 0 Hare’s Ear, dressed by Ogden Smith of Hyde Park Corner, on a fine 18 inch point. The fly happened to catch in the leathery edge of the upper jaw, so that the fine gut was never caught on the creature’s teeth, but always lay over his smooth snout. Then the area of the fight was remarkably free of long weeds, and though the gut was badly frayed it had never been checked for an instant in the weeds. Further the movements of a fish of this size were always comparatively slow and dignified, which saved the tackle from sudden jerks. Also, the increasing darkness prevented the fish from seeing me and rushing away down stream, as he certainly would otherwise have done. And lastly, the keeper’s experience in handling these slippery creatures enabled him to land it in the way he did. His first remark as we surveyed our prize was ” It is a miracle to have landed this fish” and I thought the same. To return for moment to the beginning. It astonishes me, first, that a fish of this size should notice such minute insects on the surface of the water, and secondly, that with such an enormous head and mouth it should be able to swallow them down without disturbing the surface of the water any more than a half pound trout or dace. At 10 o’clock that evening the fish was in the train directed to Mr Cooper of Radnor Street. I hope he will make the return journey safely, and often refresh me with the memory of our eventful encounter.